They're definitely strange looking, but they're also right off the runway. Then again, they touch on the current 80's (graffiti), platform, and interesting heel trends. (According to the website, the shape of their design is inspired by African tribal drawings.) Factor in that the heel height tops 6 inches, and the shank of the shoe isn't there at all. Yet, they're so interesting that it's hard not to stare. Haute Couture or hot mess... What do you think? So, how do you put your foot in this again? From one angle, it looks like a torture device, and from the other... it still looks like a torture device. Looks like the edgy graphic arts trend gone all sorts of wrong. Like on it's way to the brightly lit runway, it got lost in a dark alley. The inspired creation it was meant to be came out as the mutant thing it is now. As something to wear - no, as a piece of art to be appreciated - anything goes! I'm leaning towards hot mess, but VERY hot mess. Great find. These shoes are absolutely stunning... It really just goes to show how far footwear design has come over the years. 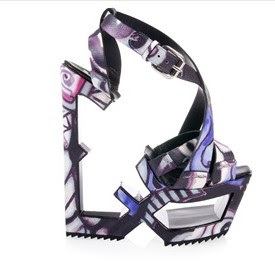 Footwear has usually been much more slow in design development thann clothing but with the likes of hot new designers such as Nicholas Kirkwood and clearly a new footwear designer at Celine I think there's plenty more where this came from! I really want a pair of these shoes, only problem is I can't find anywhere that stocks them!!! Oh yes! I need to see this shoe in action. And I have a fascination with shoe art at the moment and this is definitely in that category.